SUGGESTIONS TO PUTTING YOU ON THE FAST TRACK TO SLEEP RECOVERY. Sleep has always been one of those biological annoyances for me. I mean everyone has to do it or you will either go crazy and/or die. But those 5-8 hours taken up for “cell regeneration and restoration”was something I always felt like I could be doing other things with that time. So for as long as I can remember, I have always been team night owl. As a teen I was always one of the last ones to go to sleep which meant at pre teen/teen sleepovers I was the one rarely pranked on. Late night papers for school weren’t a big deal, and if I were in the mood for T.V. I would watch cooking shows until I finally got drowsy around …4 am. Yep, I’m that girl. What could be so interesting to stay up that late even when I knew I had a 8AM class and commute traffic to boot? The main reason: I get my best ideas between the hours of 2-4am. I don’t know why that is but it remains that way even now. Another reason is being an introvert I like quiet. Early hours are usually peaceful hours when no human or pet is asking for your attention, just peace and stillness. There are even famous “owls & larks” that will keep the debate going for years on end as to which wake time is better. WHAT ARE SOME CAUSES OF HAVING TROUBLE SLEEPING? Not too long after school came shift work. Which as anyone can tell you, can wr-ee-ee-eck you and turn you circadian rhythms upside down. It now even has its own condition name (Doesn’t almost everything?) Shift Work Disorder. Symptoms of SWD include insomnia, excessive daytime sleepiness, weight gain due to high cortisol hormones that usually help your body with controlling metabolism, irritability, and higher chances of catching a cold or the flu. I know that there are magazine ready, pretty blackout curtains out there but if you just want to get some light blocked sleep ASAP, a dark colored wide blanket will also work in a pinch. And if you have blinds, no one is the wiser from the outside looking in that you did a quick DIY. When you are in need of sleep, it is no time to be cute. Quick shout to my friend and co-worker that let me sleep in her spare bat cave after a shift. Yep. Mama slept real good, Mama slept real good. Also shout out to my lovely remote controlled standing fan, may she RIP. I am big fan of low level white noise. And that help get me to sleep many days quickly as well. Other things you can try are exercising before your shift if you have time, or on your days off. Keeping a good sleep hygiene schedule on days off & weekends if you don’t work weekends also helps. Now because we know one size does not fit all, a good sleep hygiene schedule for YOU as a shift worker would differ from the average 9-5 employee. So adjust your bedtime accordingly, that way you can still be in sync with your work schedule and get enough rest. Though we cannot officially blame it all on the forward thinking (get it?) residents of Port Arthur (Thunder Bay), Canada whether you love it (elementary kids.) hate it (most adults.) want to make it year round, (Mass.) or ignore it almost completely, (Arizona.) Daylight Saving Time (no plural.) was originally intended to do as its title says: Save the daylight in the Spring/Summer hours to allow for less electrical usage. But with almost everyone switched on does this even count anymore? DST has been studied by many to have an effect on health and creates newsworthy titles like “Daylight Saving Time linked to heart attacks”, or “Spring Forward At Your Own Risk “, etc. Why? Because DST can cause rises in blood pressure which then can mitigate strokes and heart attacks, the lost hour also adds to many already sleep deprived individuals causing groggy car accidents, and let’s not forget the many caregiver professions who require critical thinking and sharpness. Aside from sulking and refusing to change the clock, let’s look into some ideas. Sunlight sets the tone for melanin production and can aid in ‘setting your clock right’ for the day by allowing the sun to hit your eyes (close them please.) and face so as soon as you can when you get up, throw open a door or window and enjoy the warmth for a few minutes. Ok enough of that. Go to work now. During research for this post, I stumbled upon an excerpt of the documentary ‘Resonance: Beings of Frequency’ video which discussed the Pineal gland and it’s reactions to EMF. To keep more to the point of this blog post, Melatonin and Serotonin are secreted by the pineal gland therefore causing us to get drowsy at the appropriate time around 9 PM. This drowsy state serves as an internal alarm clock that reminds us to go to sleep (in the dark) to regenerate our cells, ward off colds, fight aging, and potential health issues. Pineal calcification, and it’s relation to sleep deprivation is a controversial topic that could possibly be caused by fluoride in drinking water, mercury dental fillings, processed foods, and calcium supplements. Even if you may not agree with reasons for calcification, the ways to decalcify, are pretty common sense that if anything, can boost your overall health. A DARKENED ROOM FOR SLEEPING. As mentioned before, sleep in a dark room which signals to the pineal gland “time for sleeping” and allows for the body to relax into its natural state of sleep. REPLACE ‘BIG FISH’ ON YOUR PLATE. Another easy way to care for your pineal gland is to avoid bottom feeder fish (yep, that’s shrimp & crab to name them most popular.) and the larger the fish, the more the mercury. (Big fish gotta eat shrimp & crab too.) So if you do eat fish, make sure it is wild caught. EAT NATURAL SOURCES OF CALCIUM. All the leafy greens, almonds, broccoli, chia, quinoa, and beans just to name a few provide easy bioavailable ways to get your calcium in without breaking the bank on a synthetic and or questionable source supplement. This one is a little trickier especially for insomniacs. So let’s tackle sleep paralysis first. Have you ever been asleep only to wake up and find you can’t move?!? Don’t watch the firsthand accounts of SP on Youtube it can get super creepy. You have been warned. Sleep Paralysis according to Livescience is caused by the time during REM sleep when the brain has vivid dreams, the muscles of the body are essentially turned off and are unable to move so that the person won’t be able to act out dreams with their body. 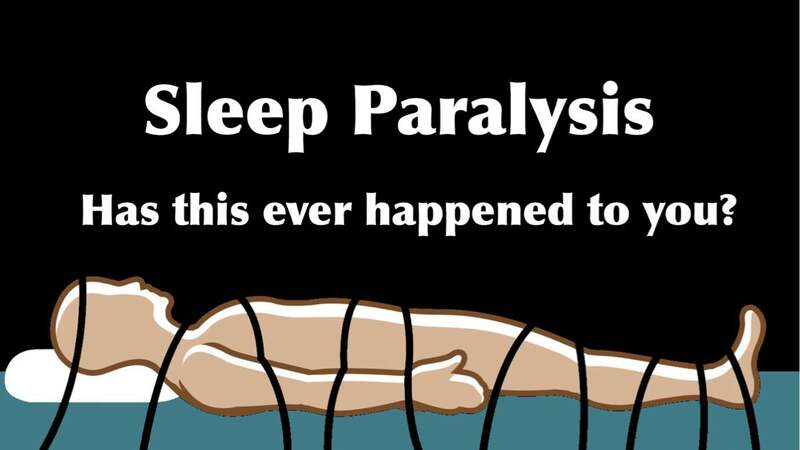 Sleep paralysis happens when a person wakes up before REM is finished. The person will be conscious, but the body’s ability to move hasn’t been turned back on yet. Having experience this first hand, I found it happened to me mostly when I was super stressed and/or not getting enough quality sleep (aka shift work). Insomnia on the other hand can also be caused by stress, night after night of lack of sleep, traveling or working, But it can also be caused by medication, underlying medical conditions, and vices such as smoking, recreational drug use, or alcohol abuse. Calming your body down by acknowledging that you are okay, and reciting that in your mind because sometimes you can’t speak and trying to ‘break free’ can sometimes make it scarier. Prayer helps as does any positive thoughts or meditations you can bring to mind so the episode goes away quickly. FOR INSOMNIACS: Which as mentioned might have physical reasons behind it, if better sleep hygiene, eating wholesome foods, reducing alcohol and smoking intake doesn’t help.Look into seeing a sleep specialist to check on other options. BLUE LIGHT (aka tablets, laptops, cell phones, desktops,T.V., etc.). Whether you are a grade school student, teen, or adulting in front of a screen for a living, most of us stand guilty as charged of blue light at night. Have we learned nothing from the Pineal gland paragraph?? Let go of the blue light before bedtime. In the end, sleep is important, and cannot be that friend we all have that we hang out with only when we’re bored and everyone else is busy. It has to be treated with respect and scheduled in properly like a bestie, so that we can maintain maximum life efficiency. I hope that this post has not only helped you to look into why you are having trouble sleeping & provided some solutions for better health, it has also encouraged you to take the challenge with me to do one thing starting next week to improve your sleep. For myself, I am going to try going to sleep 15 minutes earlier all next week so that I can work my way into and earlier bedtime of 11 PM. I have set my goal mindset and now I gotta follow through. How about you? How are you going to change your sleeping habits for the better next week? Leave let me know in the comments below. I appreciate you taking the time out to give this a read, Thank you!